In the early eighties, a new kind of pop music burst on the scene as reaction on the seemingly unstoppable rise of punk in the late seventies: the New Romantics. Helped by synthesizer sounds and often very mysterious video clips, British bands like Spandau Ballet, Depeche Mode, Duran Duran, Eurythmics, China Crisis, Visage and Human League were quite successful for a few years. 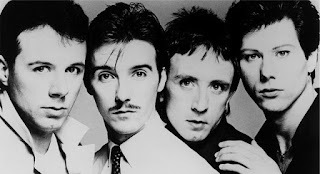 One of the best efforts from this period is by Ultravox (image credit). Their haunting 1980 single Vienna taken from the album of the same name, with its distorted violins and a highly romantic video, remains a classic.